It seems as if we have seen reports like this before. Brazilian inventors Nilson Barbosa and Cleriston Leal claimed to have invented something they call an Earth Electron Captor Generator that they say utilizes electrons from the Earth to generate an unlimited supply of electricity from a very low input. Not only this, but the team claims one of their devices, which fits into a container no larger than a shoe box, can produce enough free energy to power up to two houses. When marketed, they predicted that the tiny generator could be purchased for an estimated $5,500 in American dollars. Sound too good to be true? Do we suspect a hoax here or have these guys stumbled onto something that other world inventors, including the late Nicola Tesla, Vernon Trigger and others have claimed for years? We know that Tesla’s claim to have discovered a way to transmit free energy from his Wardenclyffe Tower at Shoreham, Long Island, was crushed by American industrial giant J. P. Morgan who blocked the financial help Tesla needed to get his project in operation. Trigger, who this writer met personally while he was working on a similar way of producing unlimited and free energy at his home in Michigan, complained that he was blocked from selling his inventions by the energy companies. He refused to speak of his discoveries. He said he was writing a book to make his invention known to everybody, but died before such a book was ever published. Trigger was believable because of his amazing life as an inventor who dabbled in the fields of radio, operating automobiles on methane gas during the war, designing and building unique homes, and his work in the field of atomic energy. Strangely, when I wrote the Trigger story, my editor refused to publish it. He said he refused to believe such a story and admonished me for wasting my time. The newspaper was owned by one of the largest newspaper chains in the nation. I never knew whether my editor was that stupid, or he was under pressure from the people above him. 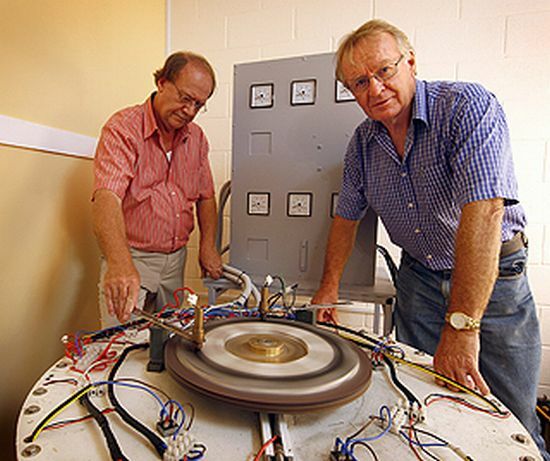 A few years ago, Australian inventors John Christie and Lou Brits claimed they found a way to use batteries and magnets to provide enough free and non-toxic energy to power a house. They said they planned to market their machine, called the Lutec 1000, which they said operated continually on a pulse-like current after it was kick-started from a battery source. Their invention appears to have disappeared into the ether with all of the others. Were they all hoaxes or is something else going on here? Electrical engineer Ovidiu Sandru, in an article explaining the suppression of the Tesla energy concept, wrote: “Based on the principles of capitalism, free energy cannot be allowed. . . By reviewing history it is understandable why some inventions are not commercialized. It is economics, not science that is the main factor. Morgan, who had been enthusiastically financing the construction of Tesla’s Long Island project, suddenly withdraw all financial support the moment he discovered that the tower’s energy output could not be measured, metered, and that a way existed for users to be charged. Barbosa and Leal have obviously stumbled on the same source of free energy that Tesla, Trigger, Christie and Brits discovered. And already they have faced harassment from government officials. A Brazilian newspaper reported in September that the two were arrested and charged with receiving stolen equipment from a Brazilian energy cooperative. All of their equipment was confiscated by authorities in a raid on their lab. Why should this surprise us?